In this issue: the Kildar returns, Western civilization stands in the balance at Marathon—plus, the January contest! After saving America from Middle Eastern terrorists, Mike Harmon and his Keldara mercenaries could use a vacation. 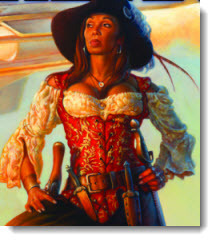 Of course, Harmon’s idea of a vacation includes taking down pirates in the Singapore Straits. And when he does, Harmon is thrust into a battle to prevent the overthrow of a nation’s capital by totalitarian tyrants. A new addition to the Ghost/Paladin of Shadows military adventure series arrives! Jason Thanou. A time traveler with a past and a burning mission: rescue humanity from aliens disguised as Greek gods. Now the god Pan is afoot in Greece and Jason must thwart a conspiracy that stretches for millennia—and save the birthplace of democracy from the corruption of the gods. Planet Baen celebrates twenty years of the worlds of Honor Harrington. 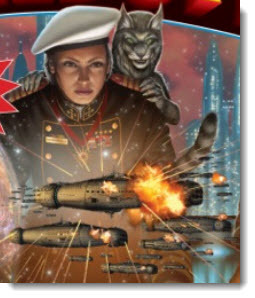 With the March release of newest series entry Shadow of Freedom, followed in April by the publication of the 20th Anniversary leatherbound edition of the Honor Harrington novel that started it all: On Basilisk Station, and finally House of Steel: The Honorverse Companion in May, it will be a spring to remember for Weber fans and new readers alike. Planet Baen joins the celebration with special gifts, whacks, and a contest. Plus, as always: play the game, get free ebooks! 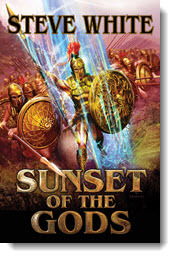 With new Jason Thanou time travel series entry Sunset of the Gods, the follow-up to imaginative and gritty time travel novel Blood of the Heroes, Jason Thanou returns to ancient Greece during the Battle of Marathon. One of the givens in the Thanou series is the “observer effect,” the property of time that makes sure that the past doesn’t change. In a paragraph, give us your opinion of the best modern day device for a time traveler to carry back in time without standing out to the locals, and especially without triggering the dreaded observer effect. When Mike Harmon and his Keldara mercenaries take on pirates in the Singapore Straits, they are thrust into a battle to prevent the overthrow of a nation’s capital by totalitarian tyrants. Latest entry in the Kildar military adventure series. The god Pan is afoot in Greece and time traveler Jason Thanou must thwart a conspiracy that stretches for millennia—and save the birthplace of democracy from the corruption of aliens disguised as gods. The Iron Cage: when a star ship arrives, Johnny must choose between the bear-like People who raised him and his lost heritage. Breed to Come: On a distant future Earth, humans return and the catlike People are in no mood to deal with those who abandoned them so long ago. Together for the first time: two outstanding entries in Andre Norton’s legendary People saga. From the creator of Monster Hunter International: Jake Sullivan is a hardboiled private eye at war with evil powers in a dark and gritty city of heroes, villains and magic. A technologically enhanced warrior must overcome generations of prejudice and meet the challenge of an alien invasion of human space. 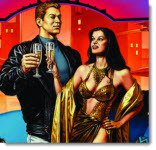 A full-length novel, and a host of short novels and more fill an action-packed volume by the master of science fiction adventure and creator of the Bolo series. The galactic Pact of Mankind is hedged by alien enemies, rotten with decadence and corruption, and ruled by a single man—the High Secretary. Now the High Secretary is dead, and the last remnants of a once great civilization must fight for survival and a new dawn. The final chapter in the Crisis of Empire series. We have a winner in the Baen Books December Best Interstellar Brew poll and contest: Jeff Duncan. 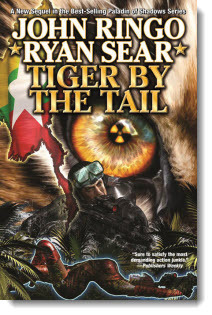 Jeff will receive a signed first edition of Tiger by the Tail, by John Ringo and Ryan Sear, the latest entry in Ringo’s hard-hitting Kildar series. Don't forget to check out the latest Ebook releases here, plus latest Baen.com free fiction here and special holiday story extra here. And don’t miss the monthly free non-fiction here.